Prequel also reportedly explains the origins of the human race, and even the Earth as we know it. A leaked synopsis for Prometheus, the kinda-sorta-prequel to Alien, has hit the internet and it makes for some interesting reading. The leak supposedly comes from someone close to the production, although that's rather difficult to verify. According to the synopsis, in 2058, an archeological find reveals that humans were genetically engineered by a race of aliens. These aliens, supposedly the same species as the "Space Jockey" discovered by the crew of Nostromo in Alien, also terraformed the Earth, making it a safe place for us to live. Part of the find is the coordinates to the Space Jockey homeworld, and the Weyland Corporation send a ship, predictably enough called the Prometheus, to investigate. On arriving in the Zeta Riticuli system, the crew of the Prometheus is greeted by the Space Jockeys, who are proud of their children for reaching such advanced levels of technology. The Space Jockeys share parts of their biotech with the crew, but one member decides that it's not enough and steals the key to the terraforming technology. This does not go down well with the Space Jockeys, who unleash their favorite bio-weapon, a creature they use to clear planets for colonization. Things don't go exactly the plan, however, and the bio-weapons - which is almost certainly supposed to the iconic aliens - turn on their creators and in the process create meaner, nastier versions of themselves. The remaining members of the Prometheus crew try to escape the planet, with a Space Jockey in hot pursuit, looking for revenge. If the synopsis is genuine, and there's not really any way to tell if it is or isn't, it's something of a mixed bag. There are some interesting ideas in there, such as parallels to the Prometheus of myth, and the Xenomorphs being designed as weapons, rather than being something that naturally evolved. 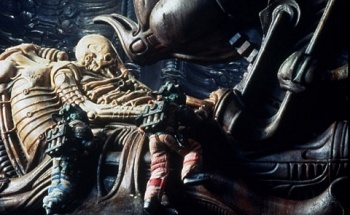 On the other hand, space gods having created humanity doesn't seems a rather far cry from the dark horror aesthetics of the first Alien movie. That part sounds more like Alien vs. Predator, and that's never a good sign.